The Eldred barely won their war for survival against the Slavern. In the aftermath, The Admiralty devised a plan to defend Eldred territory from all sides. This Interceptor is part of that plan. Used in both system defense and carrier-launched interceptor roles, the Eldred Interceptor is always the first into the fight. With twin Gyrolasers it hits harder than a lot of fighters in its Tier. The Eldred Heavy Fighter: a Tier 1/2 vessel, includes a full primary stat block. This installment of the Galaxy Pirates supplements that focus on ships clocks in at 6 pages, 1 page front cover, 1 page SRD, leaving us with 4 pages of content, so let’s take a look! 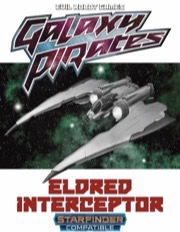 On the first page of this supplement, we get the stats for the eponymous interceptor, which clocks in as a Tiny tier ½ machine – which obviously has but one crew-member, namely the pilot. As far as defenses are concerned, we have basic 10 shields, mk 4 armor and defenses and a micron heavy power core fueling these. EDIT: Here, my review text may have been misleading for folks who don't know that gyrolasers can fire in broad arcs. I tried to state that the interceptor has only weapons facing the front firing arc. The interceptor has 2 fire linked gyrolasers, and gyrolasers have broad arc, which allows them to fire at -2 to an adjacent firing arc. The ship comes with a brief table of Computer check DCs to know something about the vessel and a VERY brief description of the craft, but not much about its story, design, etc – instead, about ½ of the first page is blank. Some additional fluff would have improved this little fellow and made it stand out. On the second page, we get a massive, one-page artwork version of the interceptor, which is really neat; we follow this with a page of smaller versions suitable for e.g. paper-mini-construction, and we close the pdf with an aesthetically-pleasing ship-sheet that ahs the interceptor’s details already filled out for you. Editing and formatting are very good on a formal and rules-language level. Layout adheres to a full-color two-column standard with a white background, and, as noted, the artworks provided for the interceptor are great and compelling, and the handout-version, the mini-version and the filled-out sheet show that he authors thought about immediate usefulness at the table – a big plus. The pdf has no bookmarks, but needs none at this length. However, unlike the larger ships, we don’t get a map of the insides of the interceptor, one of the things that really blew me away about e.g. the intermediate cruiser the Eldred manufactured. Paul Fields and Jim Milligan deliver an interceptor with amazing artworks, ready to use at the table, and for the low price of just a buck, you indeed get your money’s worth. A map would have been sweet, but I don’t hold that against the pdf at this price point, particularly considering the quality of the artwork. That being said, I do hold against it that the interceptor is a bit pale – it could have really used some additional descriptive text to make it stand out more – on the first page, there is ample blank space that could have been used to make this vessel more interesting. As a whole, I consider this to be a solid offering, though personally, it didn’t excite me to the same extent the intermediate cruiser did. As such, my final verdict will clock in at 3.5 stars, rounded up due to in dubio pro reo.